It's time to seam up our Abrams and add the finishing touches! Olga's purple Abram, with its pretty, pretty neckband. This is where you're going to be very, very pleased with yourself for taking the time to block these pieces so beautifully, with crisp clean edges that make seaming a breeze. I'll walk you through the various seaming and finishing steps here. Instructions for these techniques are in the Handsome appendix, but I'll also link to other people's excellent photo and video tutorials at each stage. First, join the shoulders with a three-needle bind-off. 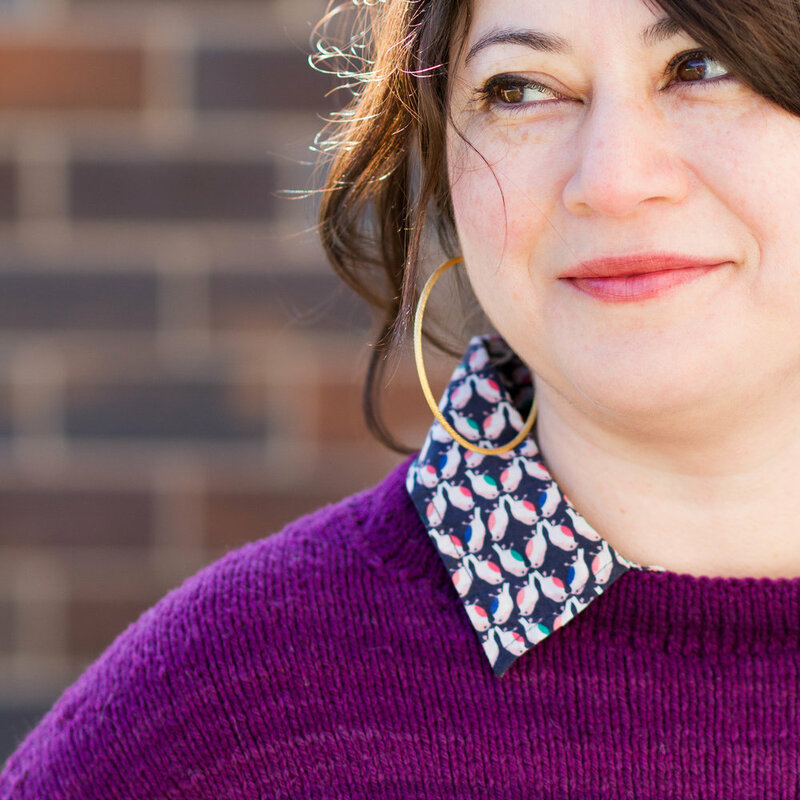 This three-needle bind-off tutorial from Purl Soho helpfully uses contrast-color yarn. Next, join the sleeves to the body. Thread your needle with a nice long piece of yarn, and you're ready to sew. Beginning at the edge of the Front piece, join the curved underarm of a Sleeve to the curved armhole of the Front using mattress stitch. Once you've joined the short curved sections, you'll reach a long straightaway on both the sleeve and the armhole. 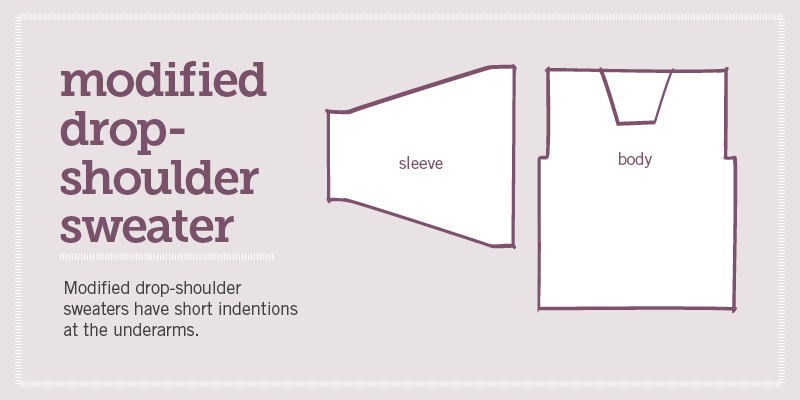 Here, you're working with perpendicular fabrics. That is, the stitches of the Sleeves are at a 90-degree angle to the stitches of the Back and Front. Kelbourne Woolens has a great photo tutorial for invisibly joining perpendicular knit fabrics. If you prefer video, Wool and the Gang has this tutorial, which helpfully uses their massive fat roving yarn. Once you reach the curved, shaped sections of the Sleeve and Back piece, just return to using mattress stitch. Now your sweater looks like mine does above. 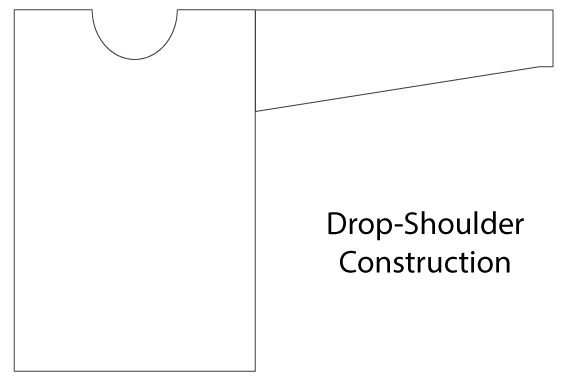 Then join the Front, Back, and Sleeves together at the side seam. Tack down the bottom and cuff hem facings. Next, you'll unravel the provisional cast-on and tack down the released live stitches at the hem and both cuffs. I like to fold the hem facing up at the turning row and pin or baste it in place before I start sewing. I tug on the provisional cast-on chain to release the stitches one at a time. As each new live stitch is released, I run my tapestry needle through it, without twisting. Then I run the needle, from bottom to top, through the nearest purl bump on the back of the sweater fabric and pull the yarn through. Working through the purl bumps allows you to follow a straight line, so that the hem facing will lie flat. Here's a quick video tutorial from Berroco Yarns showing two different methods for picking up stitches around a neckline. I prefer the first method -- the ridge that it creates on the inside will be covered by your neckband facing when you turn it inward and tack down the live stitches as you did for the hem and cuffs. I like to give my seams and hems a good heavy steam with my iron, then gently press them flat with my fingers. And that's it! You have an Abram sweater all ready to wear! Once you’ve chosen yarn for your Abram, the Handsome introduction has all the information you’ll need to choose a size and select your custom options. Because the Abram sweater is so simple in design, there are loads of options for customizing its size and shape. You can adjust the body length and sleeve length, add body shaping (A-line, V-line, or X-line), and/or work a short-row belly. You'll also choose between the broad and narrow/average shoulders option. For my Abram, I chose a size with about 3” / 7.5cm positive ease. I’m going with the narrow/average shoulders option, and I’ll be using the custom body length, sleeve length, and X-line shaping calculators. Remember that, if you use custom calculators that make your Abram longer or larger than the pattern version, you may need more yarn than the pattern estimate. Be sure to buy enough yarn! The Handsome e-book includes instructions for a crocheted provisional cast-on that begins with a long crocheted chain. The chain has little horizontal bumps in the back that look like purl stitches, and you pick up and knit your first row of stitches in those bumps. 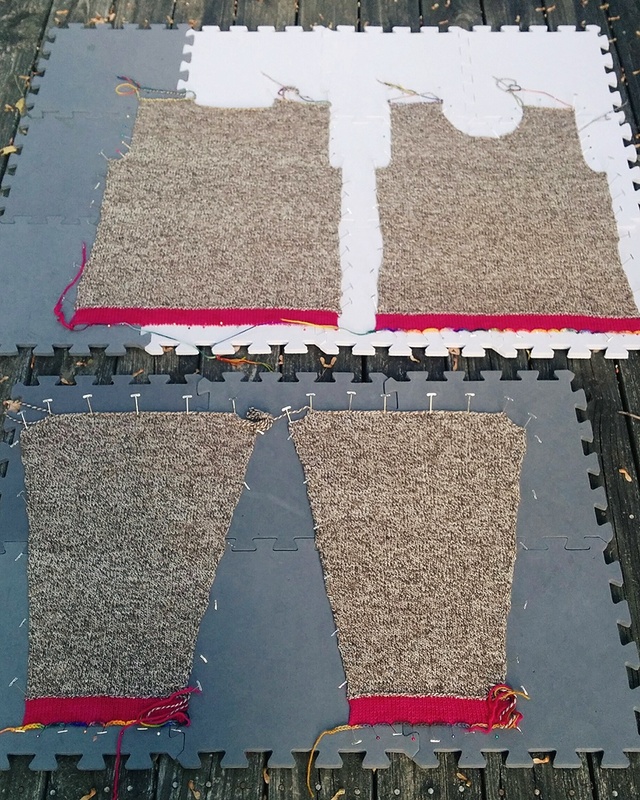 Once the Back and Front pieces are blocked and seamed together, you’ll unravel that chain to liberate a row of live knit stitches, fold the body up at the turning row, and sew the live stitches down to make a proper hem. This is what my Back piece looks like, with the hem facing plus a few inches of body. You can see the crocheted chain of my provisional cast-on (done in rainbow sock yarn) and the purl bumps of my turning row. My main yarn is Jill Draper Makes Stuff Rockwell, and I'm using some pink mystery yarn from my stash for the hem facings. Check out Purl Soho’s photo tutorial for this provisional cast-on method, or Staci’s video tutorial (below). I often use a different provisional cast-on method, in which you crochet the foundation "chain" right onto a knitting needle. The resulting cast-on is the same, but you avoid having to pick up and knit in all those little bumps. 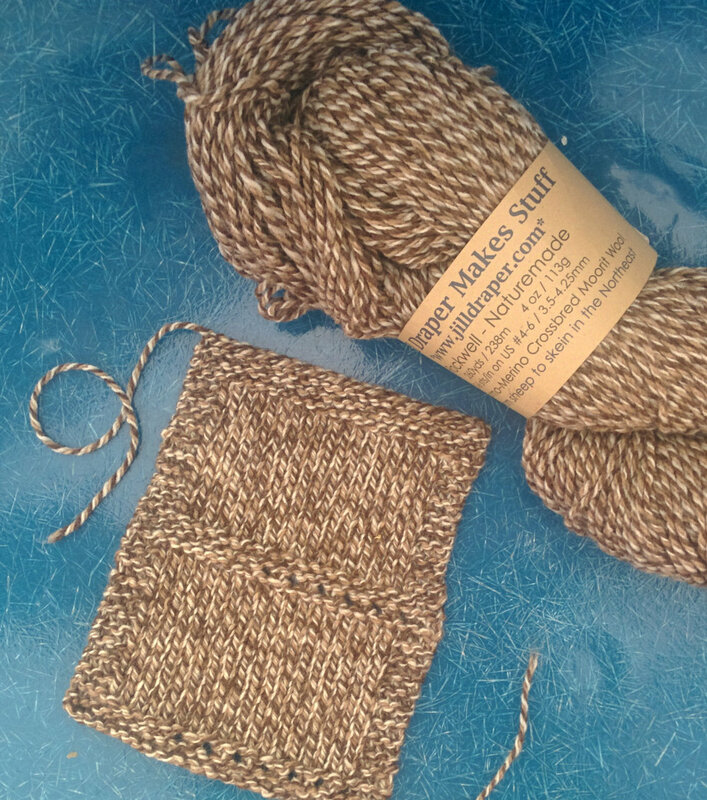 Check out Ysolda’s photo tutorial for this method, or this Purl Soho video tutorial (below). Once your cast-on is complete, you’ll work the contrast hem facing, work a single turning row, and then begin the body of your sweater with the main color, working any body shaping from the custom calculator. I’ve got very gentle X-line shaping on my sweater — just a single decrease row, then a single increase row, which takes my sweater in less than 1” / 2cm at the waist. Once you reach the underarms, you’ll work the armscyes. Abram has a modified drop-shoulder construction, which means you’ll bind off at the underarm, work a small number of decrease rows, then continue straight on up to the shoulder shaping. 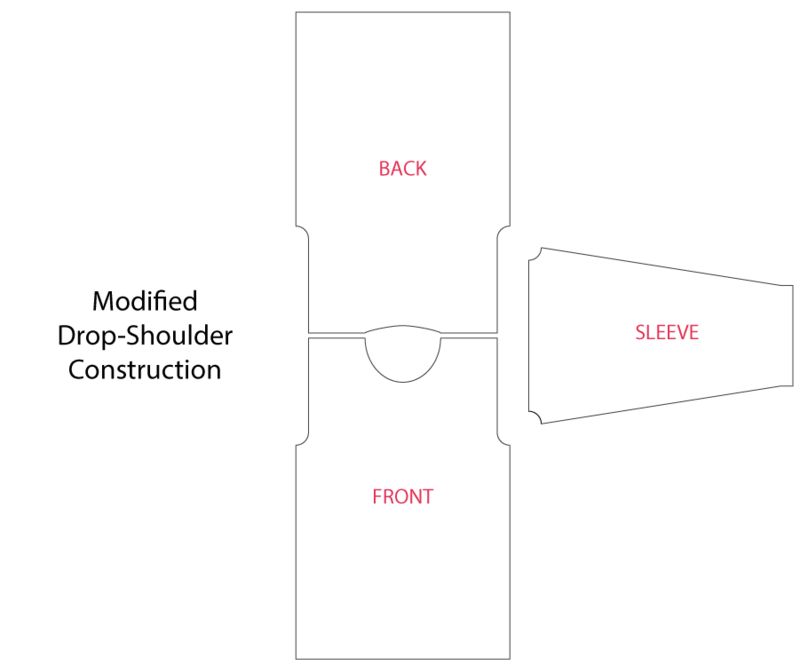 This section — the armhole — is where the Back and Front pieces differ, since the crew-neck shaping dips lower on the Front than on the Back. Finally, I want to enthusiastically promote the felted join (aka the spit splice) as a method for joining new lengths of yarn. If you’re working with any yarn that has a large percentage of non-washable wool, this is an awesome way to avoid weaving in ends and I LOVE IT SO HARD. There are instructions in Handsome for working a felted join, but here’s a quick video tutorial from VeryPink Knits, for the visual learners. She shows the method I like best, which includes removing half of the plies on each end, so that the joined area isn't any fatter than the rest of the strand.